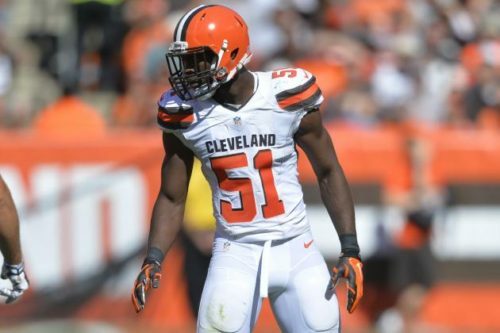 According to NFL.com, gaining mass has been an issue for NFL pass rusher Barkevious Mingo ever since he was drafted to the Cleveland Browns. But this offseason, Mingo used his time to pile on weight – with the help of 53-year-old former bodybuilding champion Vickie Gates. Gates won Ms. International titles 3 years in a row from 1999-2001, as well as 2nd place finishes in Ms Olympia during that same time frame. She was inducted into the IFBB Hall of Fame in 2010. As reported by Cleveland.com, Mingo showed up at a Browns press conference this week looking like a new man after his time spent at Gates’ home, with cardio and weight training, breakfasts that would make your head spin, and a little bit of homework help for Gates’ grandchildren on Mingo’s breaks. Read all about Gates’ regimen for him here.